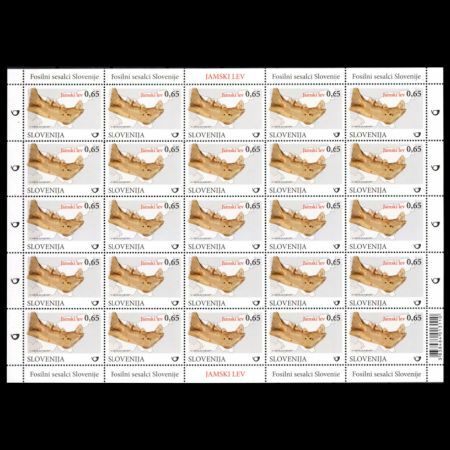 Slovenia 2017 "MAMMAL FOSSILS IN SLOVENIA: Cave Lion"
On March 17,2017 Slovenian Post Authority issued the second stamp of their multi-year set of "Mammals fossils in Slovenia" shows fossil of Cave Lion. 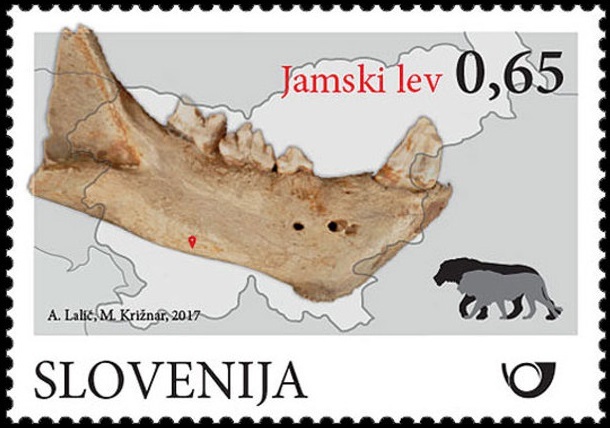 The first stamp of the set issued in 2016 and shown fossil of cave bear. 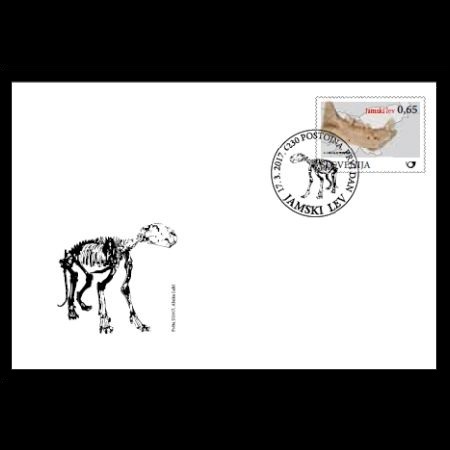 Silhouettes of cave lions were shown on draft, but disappear on the released stamp. "The cave lion (Panthera leo spelaea) was almost certainly the terror of other Ice Age creatures, thanks to its size and bloodthirsty nature. Its remains have been found across almost the whole of Europe and the remains of cave lion cubs frozen in the Siberian tundra are still being discovered today. Despite its name, the largest Ice Age predator did not actually live in caves. Its bones, however, have been found in large quantities in the sediments of dark cave passages. The cave lion lived on the open plains and probably followed the great herds of horses, bison and other large mammals. Its biggest competitors were the Ice Age leopard and cave hyena. 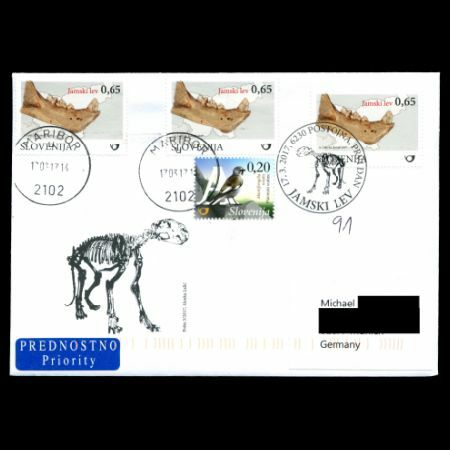 As far as the territory of Slovenia is concerned, the cave lion only lived here during very warm periods between ice ages, when the climate and territory were similar to today's African savanna. The last cave lions in central Europe died out between 25,000 and 15,000 BC. They remained longest in Siberia and Alaska, right up until the end of the Pleistocene. The cave lion was also viewed with great respect by Ice Age humans, who drew pictures of it on the walls of their caves and honoured it as a remarkable and wonderful animal. 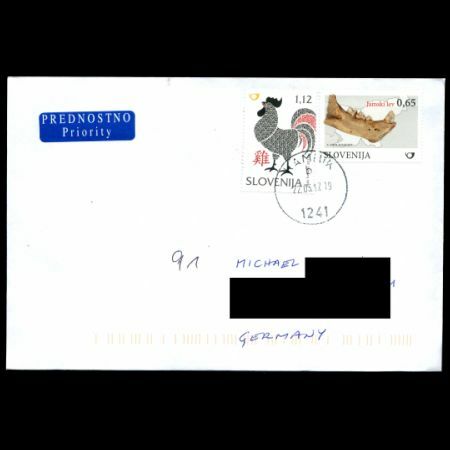 Modest finds of bones from just six sites are the only evidence of the presence of the cave lion in Slovenia. 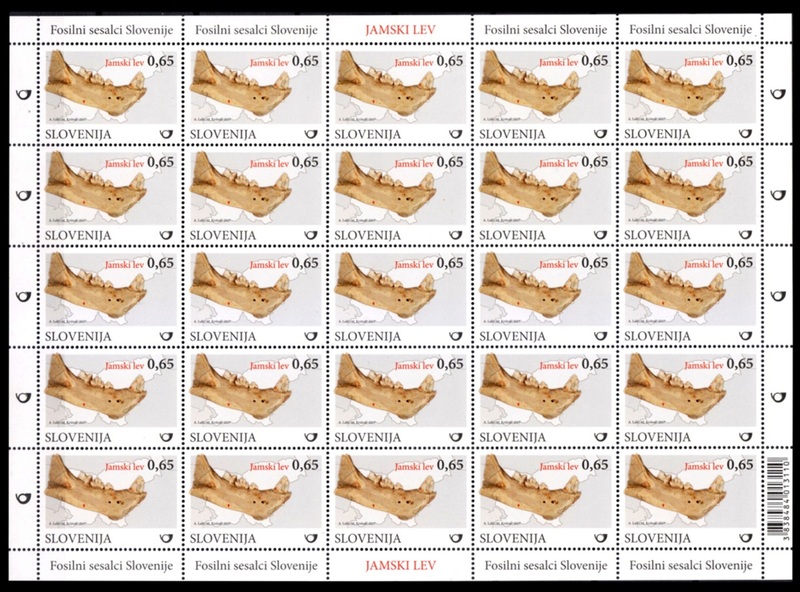 The best preserved remains have been found in the Pleistocene strata of Postojna Cave, and in fact the lower jawbone featured on our stamp comes from here. A few more bones and teeth have been unearthed in a filled cave near Črni Kal and a minor karst pothole near Lesno Brdo not far from Vrhnika. Remains have also been found in Mokriška Jama, a cave high up in the Kamnik-Savinja Alps. The other two sites are Divje Babe I, a cave above the valley of the Idrijca, and Lukova Jama, a cave in the Kolpa Valley. 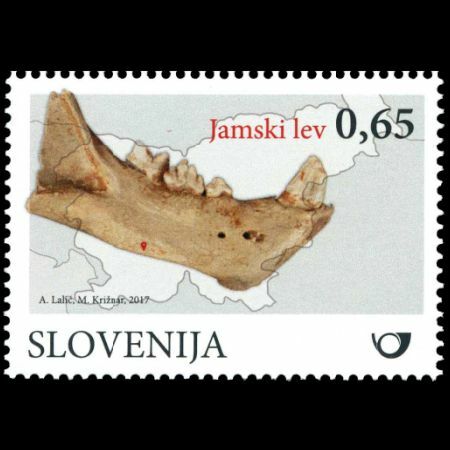 The present modest collection of cave lion remains seems certain to grow in the future, since even now the indications are that the cave lion was once found throughout the territory of present-day Slovenia. "